I love to research the background behind covers - to put the history in postal history. 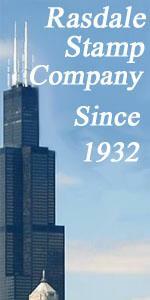 But one often encounters conflicting information, even in offi cial records. I recently acquired an interesting forwarded cover franked with a Scott CSA #2e, a 10¢ milky blue Stone Y printing tied by a JACKSON, MISS cancel. The original use is from Natchez, Miss. with a pair of stamps removed at Jackson. 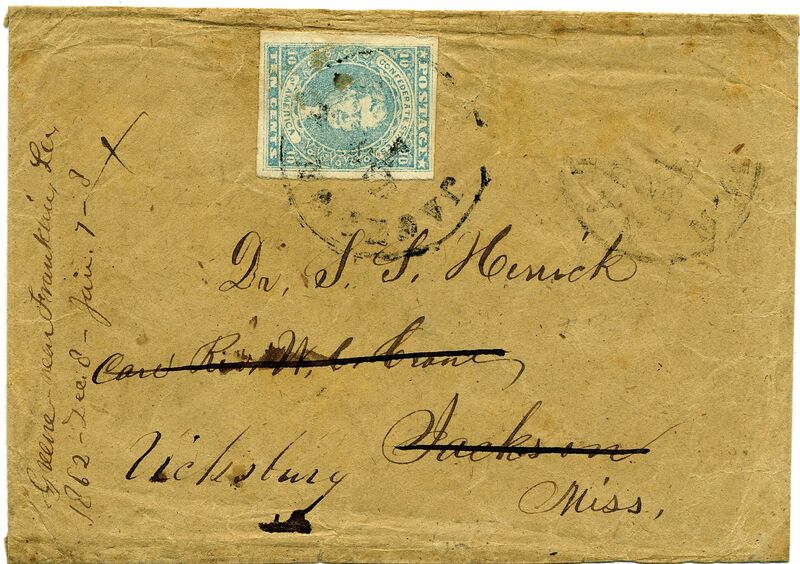 The cover is addressed to a physician, “Dr. S. S. Herrick, Care Rev W. C. Crane, Jackson, Miss”. That address is crossed out and redirected to Vicksburg. My initial research on Dr. Herrick was in Historical Data Systems, which listed their source as the Register of Offi cers of the Confederate States Navy 1861-1865. The listed information was: “S S. Herrick, Residence Mississippi; Enlisted on 11/21/1862 as a Asst Surgeon and commissioned into CS Navy (date and method of discharge not given). On 6/2/1864 he was commissioned into CS Prov. Navy. He was Surrendered on 5/4/1865. (As Asst Surgeon). He was listed as: Paroled 5/10/1865 (place not stated). Ships served on in Navy: Mobile Squadron (1862-65) Other Information: born in Mississippi.” There was a distinction between appointment in the CS Navy, whose members were considered full time professionals, and the Provisional Navy, whose members were volunteers for the war. This distinction still exists in the U.S. military today. In an effort to fi nd out more about Dr. Herrick, I contacted F. Terry Hambrecht, Ph.D., of the National Museum of Civil War Medicine in Frederick, Maryland. As I expected, his records were was far more complete and revealed significant inconsistencies. Museum records indicate that Dr. Stephen Solon Herrick was born in Vermont 12-11-1833. He graduated from Dartmouth in 1854 and taught school in Kentucky and Mississippi from 1854-59. He then entered medical school, receiving his M.D. from the University of Louisiana (now Tulane) in 1861. Herrick served both in the CS Army and the CS Navy. His CS Army service was with the 8th Battalion, Louisiana Heavy artillery in 1862. The fact that he served in the CS Army was also recognized by the CS Senate, who nominated him as Asst. Surgeon, CS Army on 03/13/1863 and confirmed him as Asst. Surgeon on 04/04/1863. This was belated because, by the time CS Senate recognized his army service, he was already in the CS Navy. He was commissioned in the CS Navy on 11/21/1862 as Asst. Surgeon. On 6/2/1864, he was commissioned into the CS Provisional Navy. He may have had a problem with seasickness as it appears he did not serve on any ships, only that he served as an Asst. Surgeon at Mobile Station and most likely in the naval hospital that was located in Mobile. To illustrate the confusion in the Confederate government, he was nominated by the CS Senate as Asst. Surgeon in the CS Navy no fewer than four times (1/20/1863, 1/28/1863, 4/30/1863, 5/30/1864) and confi rmed three times (02/06/1863, 05/01/1863, 06/02/1864). In one confirmation hearing, they claimed he was from Louisiana and, in another, Alabama. Yet the HDS/Official CS Navy records indicate he was born and lived in Mississippi! At the end of the war, Herrick was captured at the Navy Yard, Tombigbee River, near Mobile, Ala., 05/04/1865 and paroled at Nanna Bluff, Ala., 05/10/65. He served in the Mobile Squadron from 1862-65. After the war, his career is much clearer. He was a successful physician in New Orleans, becoming well known for his advocacy of public health measures. By 1890, he had moved to San Francisco where he died in 1906. It appears that he was in the CS Army in early 1862 where he probably served in the 8th Battalion Louisiana Heavy Artillery in Vicksburg until he received an appointment in the CS Navy on 11/21/62. His artillery unit stayed on and was captured. The people who forwarded the cover probably didn’t know he had left the army. And so goes the convoluted world of research, trying to piece the puzzle together over 140 years later. This is an apt demonstration of why postal historians should not stop with only one source. It often is not the full story.